Collins Booksellers - How to Make Straight A's by Doris Foxworth Odito, 9781543905311. Buy this book online. 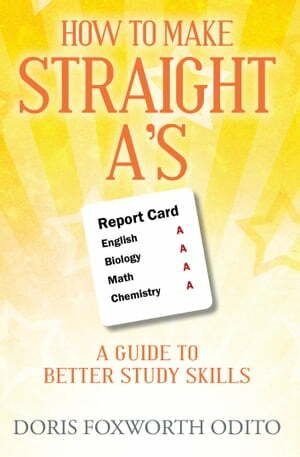 How To Make Straight A's is a book that you must read. It was written after working with thousands of bright and motivated students who needed a "coach" to teach them step-by step the skills on how to study and Make Straight A's. Think of How to Make Straight A's as your personal trainer-a coach that keeps you running towards your academic and personal goals. Every gold-medal athlete needs a personal coach. The same is true for you the student. Without directions from a knowledgeable coach, hard working and promising students can lose the benefits of their efforts. Many students want to Make A's in their school work, but they don't know how to do it. They study for countless hours, but they still do not Make Straight A's. How To Make Straight A's will give you the motivation, inspiration and drive you need to Make Straight A's. How To Make Straight A's was especially written for you a special student. Thousands of students have successfully taken the How To Make Straight A's workshops and seminars. As a result of much struggle, hard work, and total dedication, this book has finally been made a reality. And the same is true for you, with much hard work, sweat and total dedication, you will make all of the A's you want.